It’s the season of hats and gloves, boots and leggings, sweaters and turtlenecks to combat the chilly weather. It’s the season of ice skating and witnessing proposals on the ice. What better beverage for people watching in winter than hot chocolate? It seems like a pretty basic drink- a combination of chocolate, cocoa powder, and milk. The ratios of these things are critical, however, and where I fall on the Swiss Miss to Godiva spectrum is definitely at the thick and rich end of it. 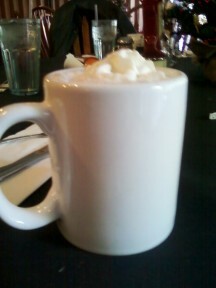 There are some hot chocolate experiences that I have never forgotten. The first one being the “Sunken Treasure Hot Chocolate” at City Bakery where they drop a truffle into your hot chocolate so that you can be rewarded with a half melted truffle at the bottom of your cup. In fact, they have an entire month of hot chocolate mapped out. I also love drinking hot chocolate out of a hug mug at Max Brenner. There are no handles on this mug so your two hands have to hug the mug as you drink the hot chocolate. 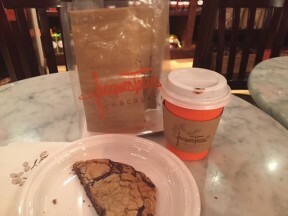 Next on my list would be Le Pain Quotidien, which I would get a hot chocolate from and watch the ice skaters at Bryant Park. At Lincoln Center, I really enjoy the hot chocolate from the Wafels & Dinges cart. It is seriously rich and good, and not too sweet. 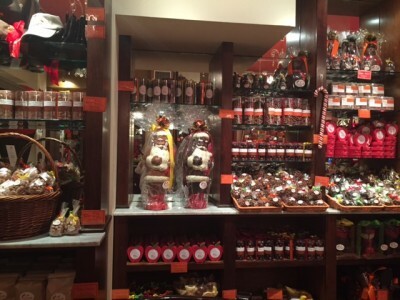 I have yet to try the hot chocolate at Eataly as well as Francois Payard Bakery but the winter has just begun! Lot of communing and people watching over hot chocolate is yet to come! My latest experience had me cracking up. I heard about the Wicked Hot Chocolate at Jacques Torres. I have become a fan of having chili in my chocolate so I knew I had to try it when I heard about it. It was so good that when I asked the clerk what was in it, she simply answered, “Crack.” It cracked me up. I agreed that it was like crack. Very addicting. So thick with tiny pieces of chocolate waiting in the cup to melt in your mouth when they got their chance. She told me that there is a mix of the Wicked Hot Chocolate that you can buy. I decided that would be too dangerous for me. The store is extra delightful around the holidays. There is chocolate covered cheerios and corn flakes, chocolate covered almonds, orange peels, and even huge chocolate Santas. Both milk and dark chocolate! I sat down for my Wicked Hot Chocolate before seeing the opera Die Meistersinger which is a five, almost six hour production. It carried me almost all the way through the opera, at least past the first two acts. Wicked Hot Chocolate and Wagner actually make a wonderful pair. This recipe comes from a very talented musician I recently met in Alexander Technique class. Joshua Wanger is a not only a singer and pianist, but also an extremely devoted chef. If you want to see the fine food he makes, check out his blog. Just try not to look at it when you are hungry. 1. Whip cream until small peaks just form. Add cream cheese and continue whisking until blended. Don’t over mix! 2. In a double boiler on medium heat (or a large heat-safe bowl on a pot) with an inch or two of water, melt chocolate chips. 3. In a separate pot, heat milk gently until hot but not boiling. Mix melted chocolate into hot milk with a whisk, add sugar. Top with whipped cream. Check back every month for Alicia’s next food column & check out past columns in our Food section. You can follow Alicia on Twitter @AliciaJLieu. Alicia Lieu grew up in Cupertino, California. She has Master’s Degree in Music Composition from the San Francisco Conservatory of Music and Bachelor of Art from UC Santa Barbara. A New Yorker with the heart of a Californian, she currently resides in Queens, NY and blogs about food in Jackson Heights.